All Saints Central offers excellent academics which are reflected by standardized test scores and college scholarship awards. Small class sizes and dedicated teachers allow for individual attention and personalized instruction. Up-to-date technology and libraries enable our students and instructors to keep pace with our ever-changing world in all academic areas. United by a common mission, All Saints Central focuses on guiding students to become well-informed, faith-filled, moral leaders of the future. 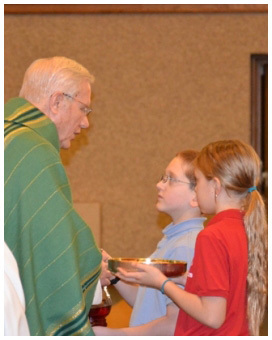 We use the academic and religion curricula developed by the Diocese of Saginaw. The academic curriculum is based on State of Michigan benchmarks with additional expectations added. Each curriculum is reviewed periodically. Experienced, dedicated, faith-filled teachers set high standards for Catholic school students. Teachers at All Saints Central must possess a minimum of a Bachelor degree, with a major in their area of certification, as well as a valid Michigan Teaching Certificate. The qualified staff combined with small class size and high expectations produce notable academic achievements for all students. Our parents are familiar with the academic expectations for their children and help to support those goals at home. Parents are encouraged to monitor their childrens' homework and assignments. In addition, parents can become involved in volunteer activities.